Hand-crafted in Czech Republic since 1864. Crowned, European solid spruce soundboard that is held to be one of the best in the world, and is aged for a minimum FIVE years. The crown can be measured by pulling a string along the longest rib. A 1/8″ crown is considered very good. Tapered ribs to enforce exact crown location. European-designed action provides excellent touch and control. Only the best wool felt is used for the hammers. There are no plastic parts in the actions and the hammers are properly spaced and aligned. 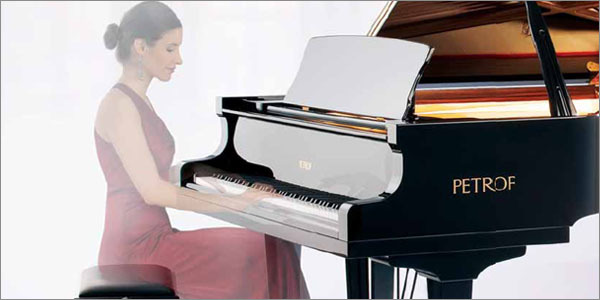 Renner-PETROF actions are used in the PE 125 upright, PE III & IV grand and Renner action in the PE 131 / 135 upright and PE I & II Concert grand. Individually weighted keys ensure a uniform touch. Full agraffe systems keep strings perfectly spaced and provide a precise upper bearing point to ensure a consistent string speaking length. High quality laminated Beechwood Pin Block. Fine German polyester material is used to provide a hard, uniform and clear finish. Beautiful European veneers, perfectly matched, are used in the construction of the clear veneer cabinetry. A full length music desk is available on all upright models. All uprights have three pedals with wooden pedal trapwork. Laminated Beechwood rim for superior structural strength and for sustaining tone on all grand models. All grands have solid, hand-notched bridges with hard wood caps. In over 140 years of its existence the PETROF company has produced more than a million grand and upright pianos. PETROF engineers and technicians are extremely proud of the fact that in the construction of both grand and vertical pianos, only classic components and traditional production methods are used. Soundboards are constructed exclusively of the finest solid spruce which is aged for a minimum of five years in the open air and then placed in drying rooms to reduce moisture content to industry standards. The pin block is produced of laminated beech. The majority of components are produced in PETROF’s own factories which eliminates the need for most subcontractors. The back of the piano, which is certainly one of the most important parts of fine piano construction, is made entirely of the finest selected European beech and spruce. The full perimeter iron frame is carefully designed and dimensioned to provide proper stabilization and unparalleled tone. The solid spruce used in the soundboards are selected from trees grown only in certain regions and which are known to produce acoustically resonant wood. Only the finest quality polyester resin finish is used on PETROF pianos. It is applied, allowed to harden, and polished by hand. The real wood veneers are of mahogany, walnut and oak, beautifully shaded and hand matched. The design of the cabinetry is among the finest in the world and fits equally well in homes and fine concert halls. For more information, please visit Petrof.com.